The proper rule of thumb is to make wedding welcome bags for all of your out of town guests. 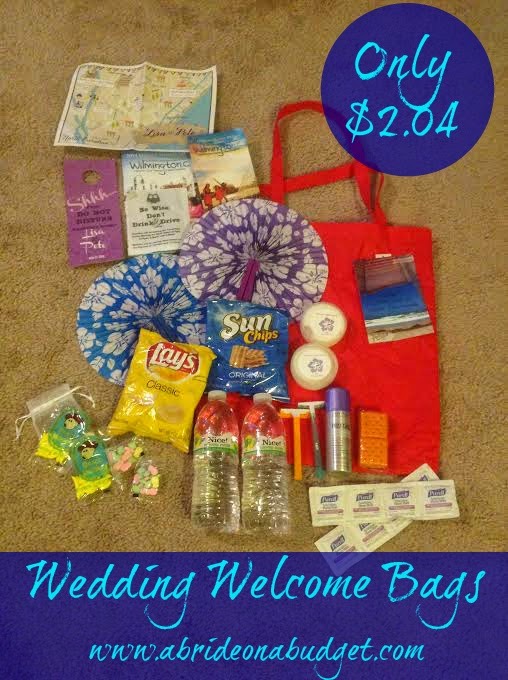 For us, almost everyone was from out of town so our wedding welcome bags had the possibility of becoming a huge expense. I couldn't add another expense to our ever growing list. I decided that we had a budget of $2 per bag so I had to be very smart about how I stocked these ... because I refused to give our guests anything that looked like it only cost us $2. In fact, we put together this amazing bag for only $2.04. Each couple (or individual, for those who came without a date) received the bag above. 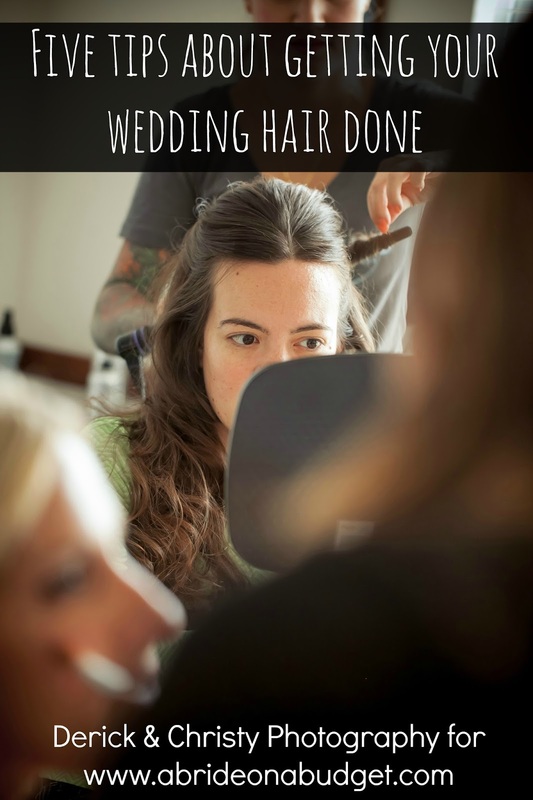 During the months leading up to our wedding, I stockpiled everything I could get for free. I also started saving any "free" money. When I would go to the gym or do a daily walk at the park, I would log my steps into my Walgreens' Balance Rewards account. Steps equals points. Points, eventually, equaled five free packs of bottled water. Kmart was giving out free Shop Your Way points weekly, so I saved those and used them towards five free twenty packs of Frito-Lay chips and six packs of peanut butter crackers. The other fun stuff -- clear nail polish, Purell wipes, razors, and hair spray were all free after coupons. The papers about our town were free from our Chamber of Commerce. So the majority of the items didn't cost me anything. 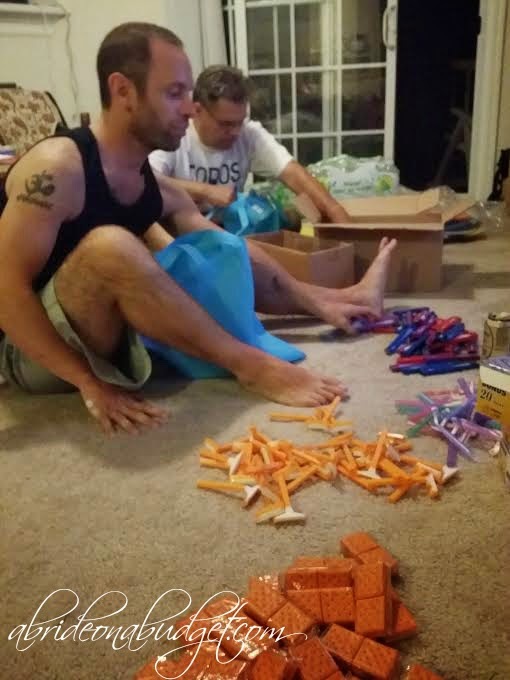 A few nights before the wedding, I set everything into piles, and we set up an assembly line. My dad was the start. He grabbed the tote bags, put in two bottles of water, two jars of Udderly Smooth lotion, and a hair spray, then passed it onto Pete. He added two foldable fans, a men's and women's razor, two strips of four Purell wipes, and a clear nail polish (until we ran out because I definitely didn't ever have enough coupons for 50 of those). 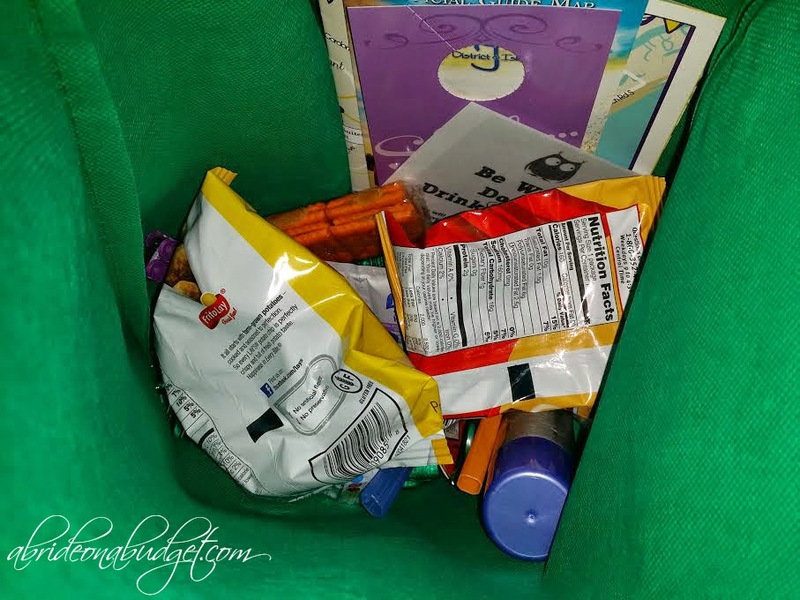 He passed the bag to me and I added in a pack of cheese crackers, two bags of chips, and a bag of candy (a white organza bag filled with two bags of banana candy and two bags of tropical candy that my parents assembled during the morning when Pete and I were asleep). I passed the bag to my mom who added a personalized do not disturb sign, a booklet and pamphlet from the Chamber, a paper I made that had shuttle information (small aside: we rented two shuttles to drive from the hotel to the reception and then back after the reception so no one had to drink and drive), and a personalized map from CW Designs. She then stapled a personalized post card that I made onto each bag, and that was that. We spent hours putting together just over 50 bags. It was great teamwork, but it did take up almost an entire night. We took a break at some point to eat cheese, crackers, and a lemon artichoke dip that Pete made based on a dip we had once before. 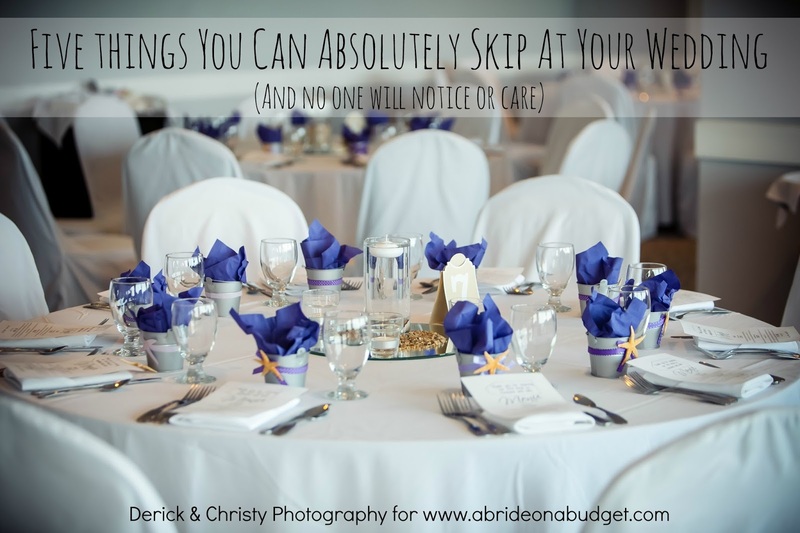 We weren't a completely ruthless bride and groom. We fed the help. Plus, I had actually put together a wedding welcome bag for my parents (who arrived the Monday before our wedding and stayed at our apartment for three nights). I put their bag on their bed so it was a surprise when they arrived. 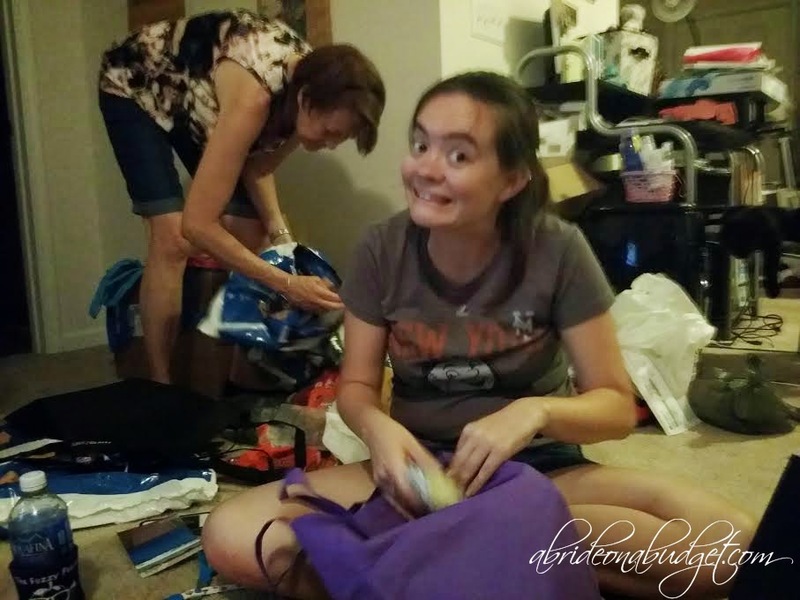 When we finished, we sorted the bags into three piles. There were the bags going to the Marriott (where many of the guests were staying), the bags going to Shell Island (the resort where our wedding was and where some of the guests were staying), and a separate pile for the guests who booked a house on the beach for a week instead of a hotel. 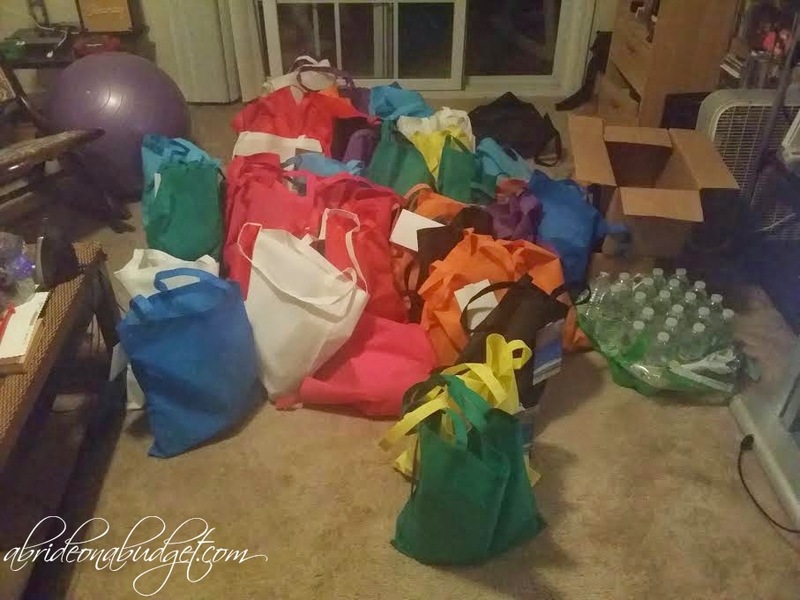 The Thursday before our wedding, when our guests were scheduled to begin arriving, we brought the bags to their respective resting places. I went over the guests with someone at each hotel to assure that the bags were handed out correctly. See, we didn't have a one bag per room policy. Some rooms had two couples staying in them (to save on cost), so some of the rooms had multiple bags. The hotel staff at both hotels (who I had spoke to about this prior to making the bags) were really nice and handed the bags out without issue. The bags were a big hit. Plus, it was an extra "suitcase" so our guests could bring back any souvenirs they picked up while they were down here. I'm always looking for an extra bag when I go on vacation, so I was happy I could give our guests one. Plus, the bags weren't branded with our names on them. Yes, we stapled a personalized post card to a tag on the outside of the bag, but that could be cut off to leave a plain bag. That way, our guests would be able to use these over and over (maybe for grocery shopping; that's what I do) and think of us. For a detailed breakdown of the price, check out the image below. Please note, the prices for items are what they were when I ordered them. Prices are subject to change at any time. From Oriental Trading, we got the 50-piece tote bag assortment for only $31.50 ($.63 a bag), beach monkey banana candy for $7.25 for 48 ($.15 each), tropical-shaped candy fun packs for $4.99) for 57 ($.08 each) and hibiscus print fans for $3.50 a dozen ($.29 each). From Walgreens, we got the water for free after points. I also got the post cards there free with a deal. From Kmart, we got the chips and crackers for free after points. From Office Depot, we got the wipes for free after a gift card from Wrapp. From Walmart, we got the razors, nail polish, hair spray for free after coupons. From the Chamber of Commerce, we got the pamphlets for free. We printed the shuttle information at home on paper we had using ink we already bought. So, in essence, free. From 123Print, we got the personalized do not disturb sign for $.37 each (You can skip these to save money but I absolutely had my heart set on them). The lotions and personalized maps were gifts to us from their respective companies, so they didn't cost us anything, which is why I didn't include them in the total. 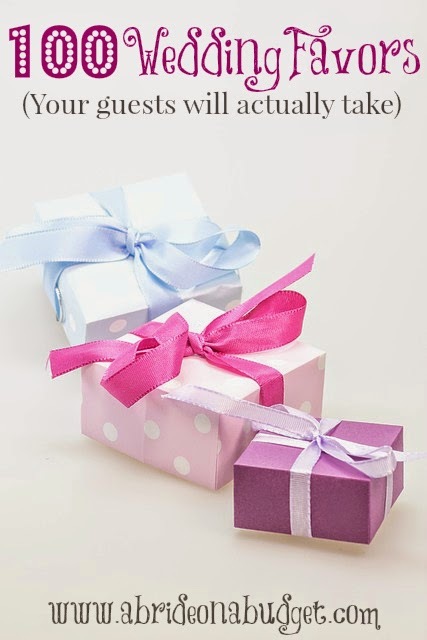 BRIDAL BABBLE: What is your favorite part of our wedding welcome bags? I would like getting the water bottles and the lotion. And a hair tie, lol. WOW! You did so good with your welcome bag. I like all the items in them and you saved tons of money doing this What a great bag to get! 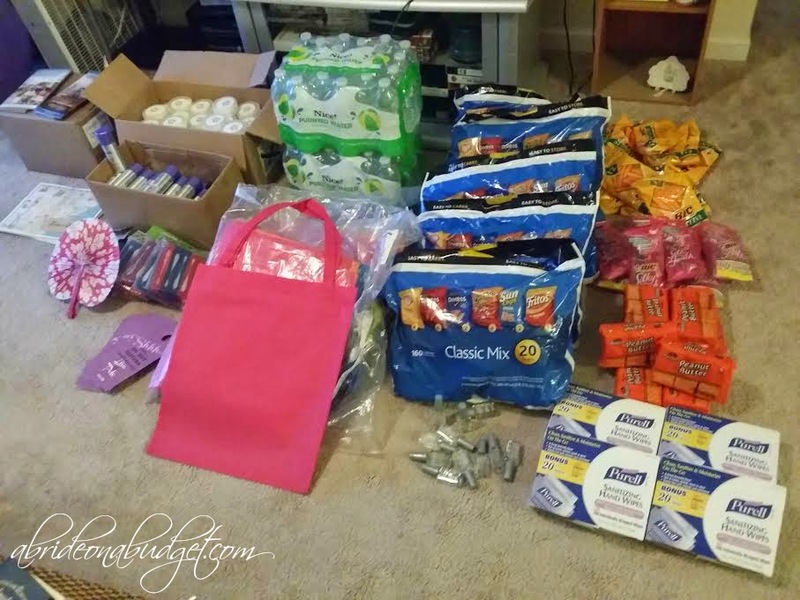 I have never even heard of a welcome bag but you did an awesome job at filling them with great stuff and really great price! This is a great idea. I like the idea of the water abd hairspray. This would be real useful. Amazing job shopping! Great prices! What a thrifty way to put a welcome bag together. Lots of goodies in their and didn't cost much at all. Wonderful bags! Excellent thoughtful and useful ! Very simple idea. 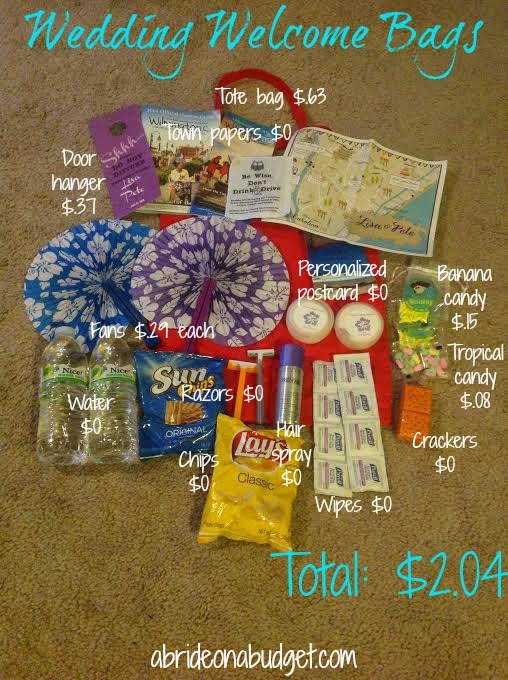 All the items were useful and it certainly doesn't look like a $2 welcome bag. What a great idea! And to get all of that for just over $2. I like the teamwork with your parents 😊 Thanks for sharing! Great job! I love this idea! Wow - it's amazing how generous these gift bags are, considering each one cost only $2.04! You are quite the bargain shopper - and it has really paid off! That's a great bag for all your guests and at a good price. How cute! I really love this idea. 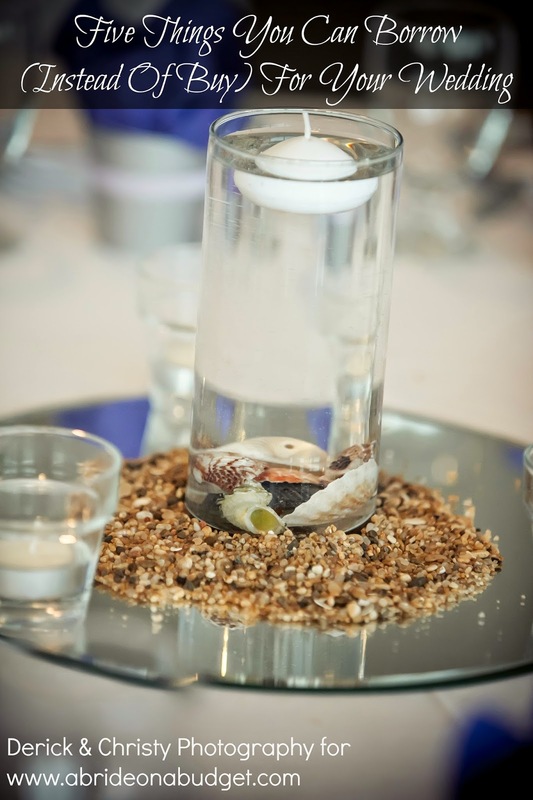 I think the water and snacks is a super sweet touch.